An impressive ultra wide-angle prime, the Canon EF 14mm f/2.8L II USM is a L-series lens well-suited for landscape, nature, and interior photography applications. Its relatively bright f/2.8 maximum aperture is well-suited to working in difficult lighting conditions and also makes this lens an ideal choice for astrophotography. The optical design incorporates two aspherical elements and two ultra-low dispersion elements to control both spherical and chromatic aberrations in order to realize a high degree of sharpness, clarity, and color accuracy. A Super Spectra coating has also been applied to suppress flare and ghosting for increased contrast and color fidelity when working in backlit and harsh lighting conditions. A ring-type USM and internal focusing mechanism also afford quick, quiet, and accurate autofocus performance, as well as full-time manual focus override. Additionally, this lens is weather-sealed for use in trying climates. 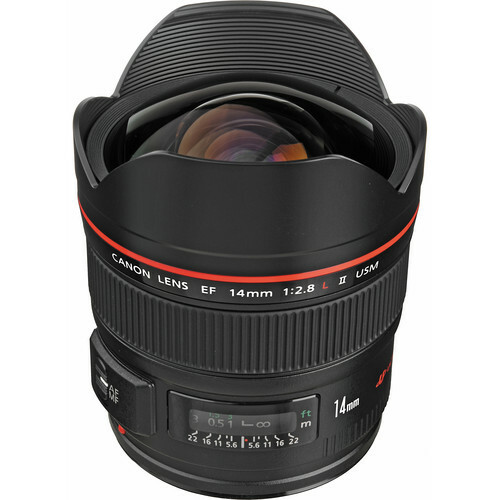 Ultra wide-angle Canon EF 14mm prime is compatible with full-frame Canon EF-mount DSLRs, as well as APS-C-sized models where it will provide a 22.4mm equivalent focal length range. Bright f/2.8 maximum aperture benefits working in low-light conditions and suits astrophotography applications. Two aspherical elements help to minimize distortions and spherical aberrations in order to maintain edge-to-edge sharpness and illumination. Built-in lens hood helps to block stray light and also protects the bulbous front element. Lens’s design accepts rear insert-type gelatin filters, which are cut-to-size and inserted behind the rear lens element. 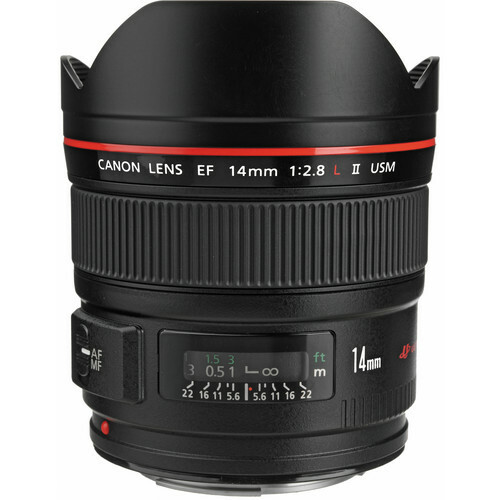 Rent the Canon EF 14mm f/2.8L II USM Lens from Deck Hand Camera Rentals today!